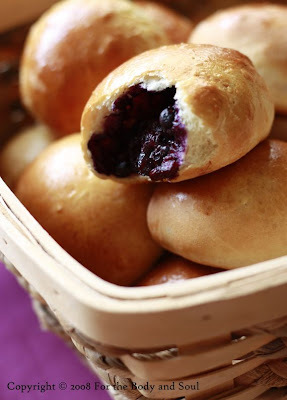 Soft, spongy, delicate with plenty of sweet and juicy blueberries inside; that’s jagodzianki, the wild blueberry buns my mother used to bake each July when I was going for my exams in Poland. I missed wild blueberry (or actually bilberry) season in Poland this year. Jagodzianki, however, have kept tempting me with their luscious look for the last three months, appearing one by one on almost all Polish food blogs. Since the season for wild blueberries starts much later in Québec than in Poland, I had to wait with baking them. Only now, when the wild blueberries are in season here, I finally made them too. They came out exactly as my mother's ones, golden outside, soft and delicate inside. Delicious!!! If you want to make jagodzianki, make sure that the bread crumbs and vanilla sugar you use, do not contain corn or potato starch. 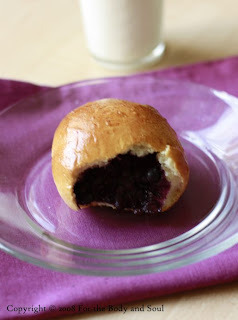 The excess of starch would turn the blueberry filling into jelly and you want your blueberries to stay a little juicy. If bread crumbs without starch are not available, reduce the amount of them to one tablespoon, or if the blueberries you use are not very juicy (I find Canadian wild blueberries much less juicy than the Polish ones) omit them completely. 1. Heat the milk over low heat until slightly warm, but not hot. 2. Place the yeast in a bowl (if you use fresh yeast, crumble them). Add the heated milk, 1 tablespoon of the sugar and 1 tablespoon of the flour. Stir to combine and dissolve. Cover with plastic wrap or dishtowel and set aside for about 10 minutes in a warm place. 3. Beat the eggs and sugar together until thick and pale. 5. Sift the flour to a large bow, add pinch of salt, then pour in the yeast mixture. Stir to combine. 6. Add the egg mixture and melted butter. Stir until well combined. 7. Knead the dough until smooth and no longer sticks to your hands. Shape the dough into a ball. Transfer to a large bowl, cover with plastic wrap or dishtowel and leave to rise for about 1 hour. 8. Place the blueberries in a bowl. Combine with sugar, vanilla sugar and bread crumbs. 9. Divide the dough into 18-20 equal pieces. Form ball from each of the piece. Flatten on your hand. Spoon the filling into the center of each circle. Raise edges of dough and pinch together over filling, then roll between palms snowball fashion to form balls. 10. Place on greased baking sheet. Cover with a dishtowel and let rise for about 20 – 30 minutes. 11. Preheat the oven to 375°F (190°C). Just before baking whisk the egg with milk and brush on the buns, sprinkle with some sugar. 13. Bake for 20 minutes, or until buns are golden. Po prostu umarłam, jak je zobaczyłam, są boskie! In addition, your blog looks absolutely beautiful, your pictures are admirable (I know it is much more to do with skills than choice of camera, but nevertheless - which camera, if I may ask?) and it's just a pleasure to read. Janne: Thank you for visiting my blog!! It's nice to hear someone who isn't Polish is interested in Polish cooking. It makes me want to post about Polish food even more ;) I'm very happy you like my pictures. I've just bought a new camera and didn't have time to learn much about food photography yet. I've been using Canon Rebel Xsi since this summer. Absolutely beautiful. I so love blueberries. I made these today for my (polish) husband and he loved them, Thank you for the recipe! I used frozen wild blueberries and they worked out. Dzieki! These came out great. My mom couldn't have been happier when I surprised her with them. Wspaniałe ,co to była za uczta. Dzieki,była to krolewska uczta,palce lizac.